December 12, 2017 – At this year’s Client Appreciation Holiday Luncheon, Omega World Travel honored Enterprise Rent-A-Car (Enterprise Holdings) with the Car Rental of the Year award. Hannah Buechel and Shawn Ryan accepted the award and shared some of their company’s latest achievements with the attendees. Enterprise, like Omega, has invested their time and resources into improving their customer experience, and has seen incredible results throughout the past year. 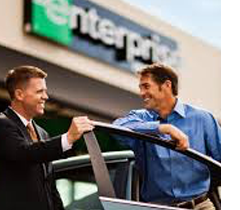 Enterprise, along with its brands, National and Alamo, received the top three spots of J.D. Power’s North American Rental Car Satisfaction Study for the sixth consecutive year in 2017. In the study, leisure and business travelers who rented cars at airports in North America were surveyed on five factors of their experience: costs and fees, pick-up process, rental car, return process, and reservation process. Additionally, the American Society of Travel Agents (ASTA) and Travel Weekly recognized the three car rental brands as “travel experts and professionals who make lasting, innovative contributions to the travel sector,” and Enterprise and National were recipients of Travel Weekly’s 2017 Magellan Awards. Omega has built a strong relationship with Enterprise throughout our 45 years in business. President and CEO, Gloria Bohan, states that there are “many links in the chain to a successful trip, and working with quality suppliers has benefited our travelers over the years.” Partnerships with excellent vendors like Enterprise allow Omega to achieve our goal of providing the best possible travel experience for our customers.